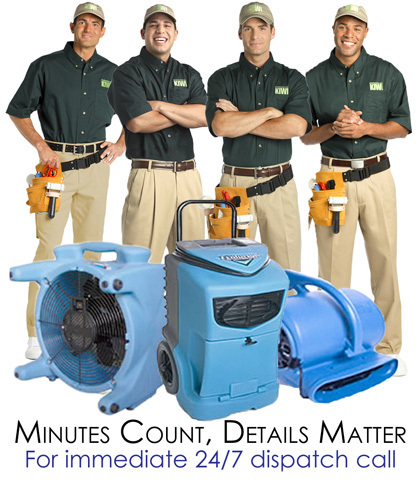 KIWI Services offers Denver water damage repair services that are designed with you in mind. Unlike other water extraction and restoration companies, KIWI provides services 24 hours a day, 7 days a week, because we know that water damage doesn’t always happen on your schedule. KIWI Services has 30 years of water damage repair experience and is one of the most trusted names in the industry. So when you have water damage in your home, call on a professional you can trust. Call KIWI immediately at the first sign of water damage, because with water damage, minutes count and details matter. When it comes to water damage, KIWI is above the rest with unsurpassed quality, value and service. When you schedule a water damage repair in Denver, you can expect expert care and quality services. Emergency Response. Our professional team of water damage specialists are available 24 hours a day, 7 days a week to answer you in your time of need. Give us a call anytime of the day or night and a friendly member of the KIWI team can be at your home in a matter of minutes. Repair and Restoration. KIWI will identify the cause of the water damage and then begin extracting the water. KIWI also takes steps to prevent the future growth of bacteria, mold or mildew by thoroughly drying, disinfecting, and monitoring the moisture levels in your home. Licensed, Bonded & Insured. Don’t risk the safety and security of your family by having non-licensed or under-insured workers on the property. Certified. Go with a name you can trust. KIWI is certified by the Institute of Inspection Cleaning and Restoration and can promptly assist you with insurance claims and other third party payment claims. Guaranteed! KIWI is committed to your satisfaction and is proud to offer a full one-year guarantee on all water damage repairs. For more information about Denver water damage repair, call KIWI Services today to schedule a service with one of our home care representatives. For immediate assistance call 720-943-2911. We will Work directly with your Insurance Company.